The botanical name for the walnut tree genus is Juglans, which translates to "Jupiter's nut." It belongs to the Juglandaceae family, which also includes hickories and pecans (Carya spp.). 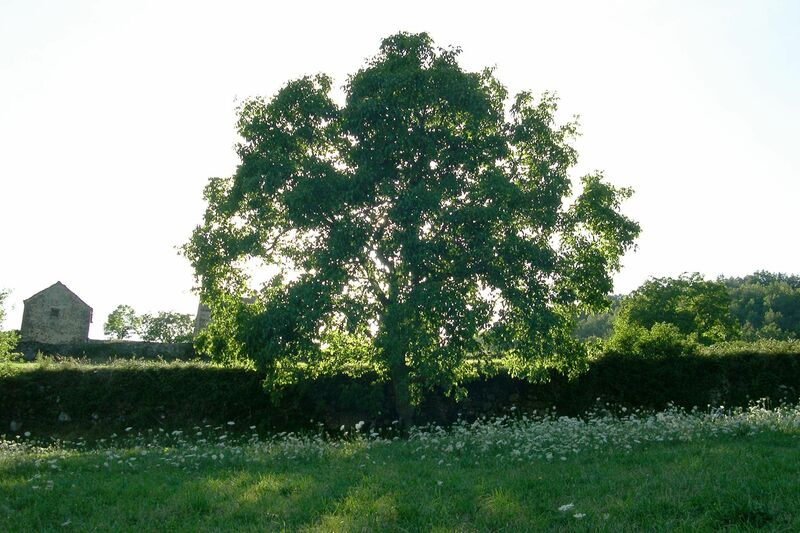 Walnut trees are monoecious, meaning a single tree contains both male (catkin) and female (pistillate) flowers, allowing the trees to self-pollinate. Nut production is best when walnut trees of different cultivars are planted in groups, as is typically done in walnut groves cultivated for nut production. When choosing a walnut tree for planting on your property, look closely at the recommended U.S. Department of Agriculture zones as well as the tree height and normal exposure type. It is important to choose the plants around your walnut trees carefully. This genus produces a toxin called juglone that can be harmful to the plants around it in varying degrees, through an effect known as allelopathy. Make sure any surrounding or companion plants you are considering are not prone to juglone toxicity. The Andean walnut tree is a slow-growing tree that can get up to 130 feet tall. It has grooved, red-brown bark and an oval-shaped canopy. In moist conditions, the tree features a single, stout trunk. In drier conditions, there are usually several slender trunks. The walnuts from this tree are cultivated for their distinctive and desirable taste. These trees are also grown for its lumber. Many cultivars of this tree have been developed for improved quality nuts or wood. J. australis is a spreading deciduous tree, up to 80 feet wide, which produces first quality lumber, with its trunk straight up. The immature and mature fruits of this tree are also consumed. J. cinerea is a deciduous tree growing up to 60 feet tall. Butternut is a slow-growing species that rarely lives longer than 75 years. The California black walnut can be either a large shrub with 1 to 5 trunks or a small, single-trunked tree. The main trunk can fork close to the ground. It has deeply channeled thick bark that furrows with maturity. This tree is an Old World walnut tree that is called the English walnut, but it actually comes from China. This tree's history reaches back to stories involving Alexander the Great when he first introduced this tree as Persian in origin. Juglans hindsii has only one confirmed native stand remaining. It is considered seriously endangered in California. It is threatened by hybridization with orchard trees, urbanization, and habitat conversion to agriculture. This is a deciduous tree growing up to 65 feet tall with light grey bark. The male flowers are yellow-green catkins produced in spring when new foliage appears. The female flowers have pink or reddish pistils. Other Common Names: Heartnut, which is specifically Juglans ailantifolia var. cordiformis, though some set it as its own species (Juglans cordiformis). Siebold walnut is another possible common name for the Japanese walnut. The tree is exceptionally hardy (down to at least -50 F), has a relatively short vegetation period compared to other walnuts, grows rapidly and is cultivated as an ornamental in colder temperate regions all over the Northern Hemisphere. Its nuts are edible but small and difficult to extract. This is a large shrub or small tree (average 10 to 30 ft tall) which grows wild along streams and ravines. Botanical Name: Juglans microcarpa. It may also be known as Juglans rupestris or Juglans nana.